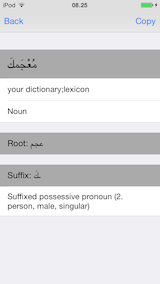 Aratools Arabic - English dictionary is an electronic dictionary available on the web, as an iPhone application and as a Windows and Mac OS X application (beta versions to be released soon). Over 80000 stems in dictionary. Especially suited for translating arabic news sources or for Arabic language learners. 7/2 - 2016: Version 1.8.1 for iPhone, 1.1 for Android and 0.94 for OSX is now available with the following new features. 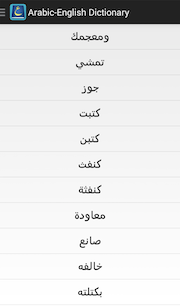 Option for larger Arabic font. Input from the pasteboard on Android and iPhone. Application URL for entering input from other apps on iPhone. Public intent for entering input from other apps on Android. App extension for launching the dictionary within other apps on iPhone. 17/7 - 2015: Version 1.7.3 is now available for the iPhone and version 1.0.1 for Android. 18/5 - 2015: Update version 1.7.1 of the iPhone version is now available in the App store, but some issues causing crashes are still present in this version. We have submitted another update, version 1.7.2, to the App store which should fix the remaining crashes and have asked Apple to review and publish it as soon as possible. 16/5 - 2015: There's currently an ugly bug crashing the app in the iPhone version. An update with a fix has been submitted to the Apple App store and hopefully will be available very soon. In the meantime please contact support@aratools.com. 1/5 - 2015: Android version is now available. 6/4 - 2015: A test version for Windows is now available along with an improved version for Mac OSX. 24/2 - 2015: A number of root entries have been corrected. English-Arabic Dictionary is experimental and not complete. Please note that this application depends on functionality that may not be present in older browsers. If you experience problems try to use a recent version of Firefox, Internet Explorer or Safari. We work hard to ensure that Arabic script is displayed correctly across all web browsers and operating systems, but if you see incorrectly displayed text please tell us at support@aratools.com. 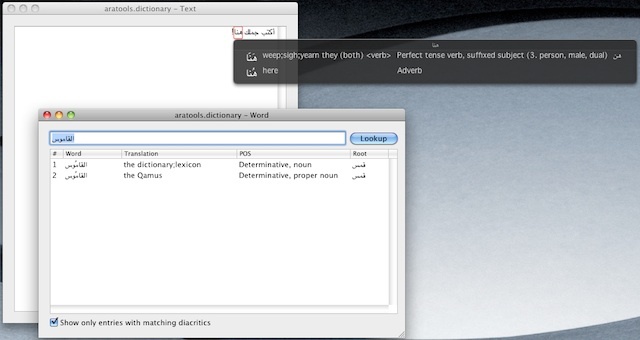 This is a beta version of the Arabic-English Dictionary for OSX. New releases will be available on this page. Updated January 2016. The application is now signed with an Apple Developer ID. Some improvements to the word dictionary: Better completion and English words. Many root entries has been corrected. 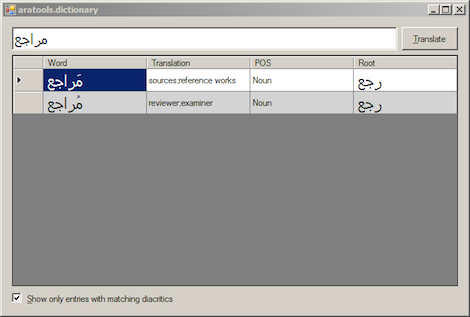 This is a beta version of the Arabic-English Dictionary for Windows. New releases will be available on this page. This is a preliminary beta version. As such it is not complete, ie. icons are missing and font settings are not optimal. It requires a separate download of Microsofts .NET framework version 4.0 or higher. 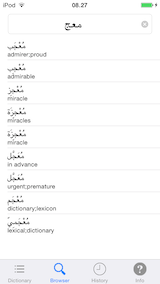 Aratools Arabic-English dictionary is available for the iPhone/iPod Touch through the Apple AppStore. The dictionary is straigthforward to use, type an arabic word and a list of possible english words appear. Select one of the english words to see further information about this arabic word such as the word class, root and some morphological information. 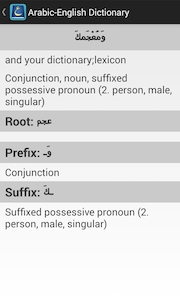 Aratools Arabic-English dictionary is available for Android devices from the Google Play store. 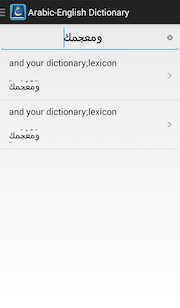 The App requires an Arabic keyboard installed separately. How do I enter Arabic words on my iPhone/iPod? 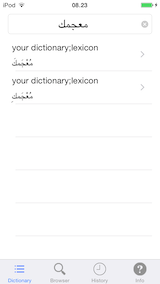 Before using the Arabic-English dictionary you must first setup the arabic keyboard on your iPod Touch or iPhone. Please exit the application and follow these simple steps. Select the settings application from the home page. Then select the General option from the list. Check if the Arabic label is unmarked. Check it if it is. The Arabic keyboard can now be activated by pressing the globe key in the bottom row of the iPhone keyboard. How do I access some characters like the hamza ? The hamza can be entered by holding down the alif key. Holding down the alif, waw and ya keys also lets you enter a hamza seated on the respective letters. Holding the the key depicting a fatha lets you enter the other diacritics used in Arabic script. 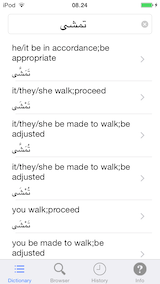 Do I need to connect to the internet to use the iPhone Arabic-English dictionary ? No, the dictionary data is contained in the application itself on the iPhone/iPod touch. The dictionary never connects to the internet. If you have any problems, questions or other enquiries, feel free to contact us at support@aratools.com. Programmers, linguists or users that are interested should feel free to contact the original author at the same email address.